Will my laptop fit in the laptop compartment ? Please note that when we state that the bag holds up to a 15.6” laptop, this refers to the diagonal measurement of the screen size. When the customer is determining if their laptop will fit, they should make sure to make note of the rectangular measurements (Physical Dimensions) of the laptop (see photo below). The Phsyical Dimensions for all McKlein Bags can be found in the details tab on the product detail page. How do I clean and condition my bag ? How To Clean Your Bag: 1) Apply one or two sprays of the leather cleaner to a wet cloth or sponge applicator. 2) Apply one section at a time to work up the foam and lift the dirt out of the leather. 3) Use a clean damp cloth or sponge to rinse the leather. 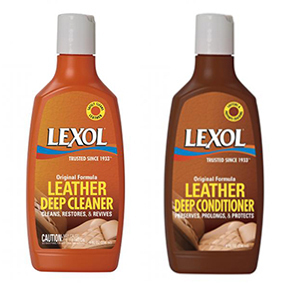 4) Once the leather is clean you can preserve it with the Lexol Leather Deep Conditioner. How To Condition Your Bag: 1) Apply a small amount of the Leather Conditioner and cover the area evenly. 2) Let the lotion sit on the leather for a couple of minutes and then gently buff with a soft dry cloth. 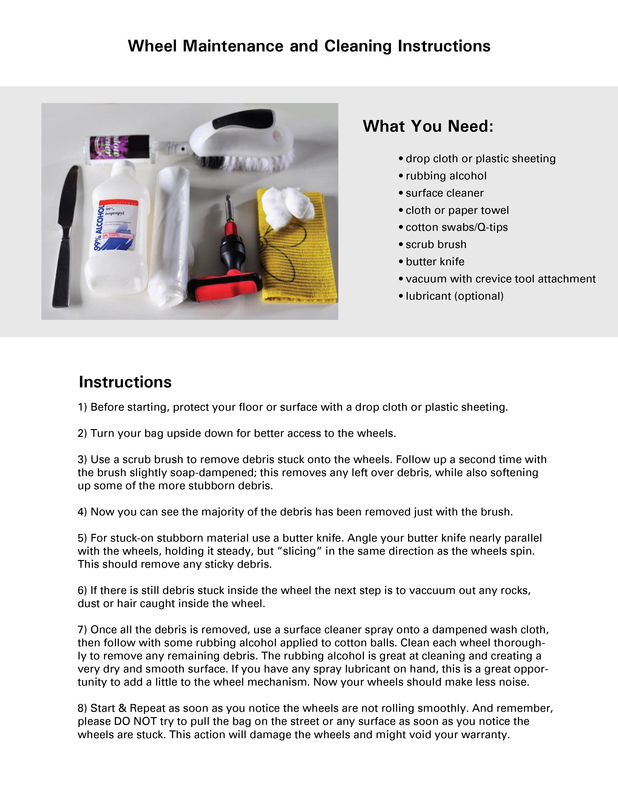 3) Repeat these steps every month or so to keep the leather in great condition. Click here to learn more about Lexol leather cleaners and conditioners. How Mcklein bags are made ? Our leather bags are made at our family owned and operated state-of-the-art manufacturing facility in Thailand. Our factory has been operating for over 35 years and is one of the world’s leading leather goods producers. Our highly skilled artisans have directed the modernization of our manufacturing process. Sophisticated technology enhances our capabilities without replacing craftsmanship. The process begins with selecting only the finest, unblemished hides. There is no room for error. Proper preparation of these premium full grain hides requires the skilled craftsmanship of superior tanners. Full-grain leather is the highest quality. McKlein’s leather cases are made of 100% full grain calfskin or cowhide. We use full grain because over time it will retain strength and durability while taking on a unique patina. Top grain is the second highest in quality. It is literally the top of the hide. Before it can be used it must be split, sanded and coated. The grain remains allowing the fiber strength and durability. The grain also has breath ability, resulting in less moisture from prolonged contact. Rather than wearing out, it will develop a patina over time. Can my bag be personalized? What should I look for when selecting a business case? I just received my briefcase. How would I set the combination on my lock? McKlein factory combination is set at: 0-0-0. If your combination is not set at 0-0-0, please reset to 0-0-0 and proceed with the following steps. With a pen, push button and press inside. Hold the button down and enter your new combination Loosen pen, button returns to the original position. Your new combination is now set. My bag has a lock, but I can't find the key. 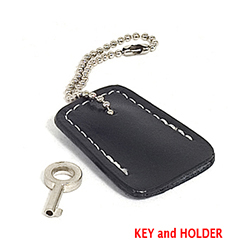 If your bag has a silver lock, the key is tucked inside the small leather pouch that you’ll find hanging by a chain on the side of the bag. First, be sure to remove the protective film covering the face of the lock. Place key into lock. It is not a snug fit and it is not necessary to insert entire length of key. Your bag is unlocked for shipping, insert key, clockwise to lock, counter clockwise to unlock. Stop when you feel resistance. Remove key and check clasp. Since the key only needs slight insertion and the mechanism is silent, you may not realize that it has worked. Where is my weatherproof cover? 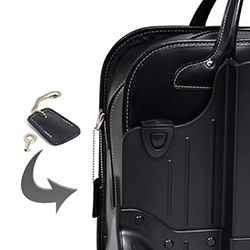 An extra buckle clip comes with every detachable wheel case. Our wheel case frames have a solid or a cut out design. 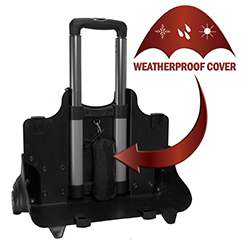 If your frame is solid with either a single or a double telescopic handle, the buckle clip hangs on the frame tucked between the frame and bag. 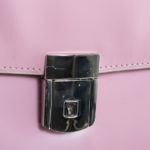 On the cut-out frame, t he buckle clip hangs on the inside of the frame next to the back of the bag. 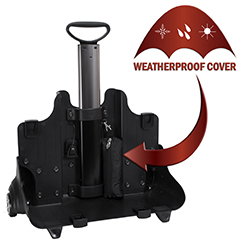 If your bag has a single telescopic handle, the buckle clip is inside the bag along with the rain cover and shoulder strap. How to remove the plastic covering on my lock? A protective plastic covering is placed on all metallic locks. To remove covering peel plastic off starting at the sides of the lock. Once most of plastic is removed there will be residual plastic spots. Spray an adhesive remover on a clean towel and wipe lock. I can't remember my lock combination. What should I do? Please do keep in mind that the items that you will be looking for (ex: metal rod, indentations), cannot be physically touched. This process will also take some time to do. First you will need good lighting (either stand by a window to get sunlight or use a flashlight). Then what you’re going to do is look inside the lock (in order to do that, you would have to maneuver each dial and look in between the really small spaces in between them). What you are looking for first, is a metal rod. This metal rod is where the dials all rotate around. Also note that this rod that you are looking for, you will not be able to touch it. (Please note that looking inside the lock will be really difficult to do since the space/slits are really tiny, but it is possible. ) Once you have found the metal rod, you will have to rotate each dial one by one. (We suggest starting your dials on the combination that you have set for your case) Start with the first dial and rotate it until you see an indentation on the metal rod. Where the indentation is, is where the number is set for that particular dial. Repeat this for the second dial and for the third. Once you find all 3 indentations on the rod, and they are aligned, you should be able to open up the lock. If this does not work out. We suggest taking your case to a local locksmith in order to unlock the case. Your other option would be to send in your case to us and we’ll go ahead and repair or replace the lock for you. Do McKlein bags fit in plane overhead compartment or under the seat ? Customer must check with airline to review restrictions. How can I get my McKleinUSA bag monogrammed? We blind deboss on a matching leather patch and we affix the patch to the bag giving it a sewn on appearance. Click Here to view images of some of the work we have done. Please call 773-235-0600 if you would like to place a monogram order. How do I replace the wheels on my frame ?